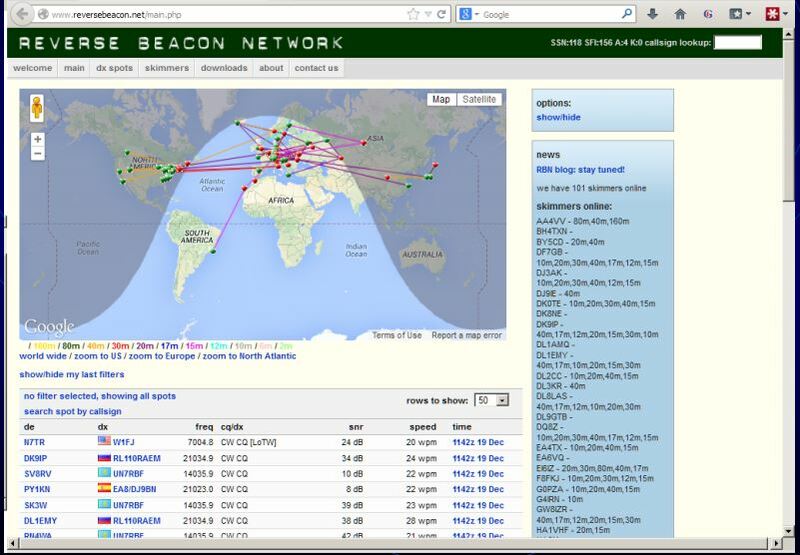 As a beta test, the popular Reverse Beacon Network (RBN) has announced that it’s now offering a separate telnet feed for FT8 spots (telnet.reversebeacon.net port 7001), in addition to the current spot feed (telnet.reversebeacon.net port 7000), which will be repurposed to handle only CW and RTTY spots. In addition, a beta version of Aggregator Version 5 that can handle FT8 spots received from WSJT-Xwill be available on the RBN website, with instructions on how RBN node operators can configure their nodes to spot FT8 call signs on one or more bands; this will not interfere with the ability to spot CW and RTTY call signs, the RBN team assured in its announcement, explaining its reasoning for the move. The beta test follows a limited alpha test aimed at getting a feel for the spot load and other implications of carrying FT8 spots on the RBN. The RBN team said it wanted to find out whether RBN servers would be up to the task before the fall contest season. “Operators of ‘retail’ DX clusters are encouraged to offer the option of RBN spots with and without FT8 spots, as they now often give users a choice between spot streams with and without Skimmerspots, and to advertise when they begin to carry FT8 spots,” the announcement said.